How will she find a husband? Part of Sisters of Scandal: After her mother’s latest outrageous affair, innocent Prudence Lattimar has fled to Bath. With her dubious background, she must marry a man of impeccable reputation. A clergyman with a title would be perfect. And she must steer clear of Lieutenant Johnnie Trethwell—his family is as notorious as hers, no matter how funny, charming and unfailingly honorable he is! 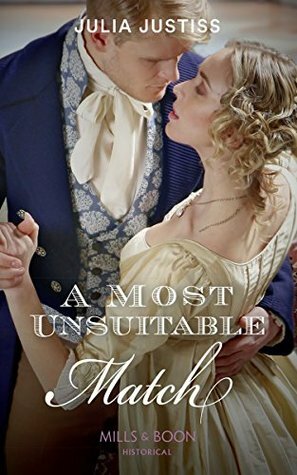 A Most Unsuitable Match by Julia Justiss is a 2018 Mill & Boon / Harlequin Historical Romance publication. The girls’ mother creates yet another scandal, thwarting their plans once again. Fleeing to Bath, Prudence hopes to meet a man who will give her the social status and respect she needs. All she wants is to live a quiet life away from scandal and have a family of her own. However, the man she finds attractive, kind and honorable, also boasts a less than stellar reputation, which simply will not do. So, Prudence accepts the attentions of a clergyman, although his motives are a bit suspicious. Lieutenant Johnnie Trethwell has returned home after many adventures to recover from a combat injury. He needs money, but his only hope is to marry a woman with a generous dowry. When he meets the lovely Prudence, he is quite smitten, and she would certainly provide him with the coin he needs. However, However, his own tainted reputation and desire to continue living an adventurous life, makes them incompatible. But, that doesn’t stop him from assisting Prudence’s entry into society, or guarding her virtue, or protecting her from mistreatment and vicious gossip. However, the more he learns about her seemingly legitimate prospects, the more he worries about Prudence’s future happiness. This sweet story has a nice ‘opposites attract’ theme, as Prudence wishes for a quiet life and Johnnie is hoping to live a life full of adventure. It is so often the case that those who appear scandalous are in fact the most honorable and true, while those who appear respectable could be hiding far worse sins. Although most of us are not under the extreme pressure to adhere to society’s pressures, in contemporary times, the weight of which felt heavy and palpable for Prudence, we still judge people unfairly, assume guilt by association, and hold women to a different standard than men. I enjoyed the way the romance developed. While Pru and Johnnie are attracted to each other right from the start, they first forge a solid, respectful friendship, getting to know each other, and falling deeply in love in the process. I loved how each of them got what they wanted- making concessions in order to build a wonderful life together. This is a sweeter romance without a lot of steamy sexual content, but the depth truly shines, as do the gentle messages within the pages. ulia Justiss grew up breathing the scent of sea air near the colonial town of Annapolis, Maryland, a fact responsible for two of her life-long passions: sailors and history! By age twelve she was a junior tour guide for Historic Annapolis, conducting visitors on walking tours through the city that was a hotbed of revolutionary fervor. (Annapolis hosted its own tea party, dispensing with the cargo aboard the "Peggy Stewart," and was briefly capital of the United States.) She also took tourists through Annapolis's other big attraction, the United States Naval Academy. After so many years of observing future naval officers at P-rade and chapel, it seemed almost inevitable that she eventually married one. But long before embarking on romantic adventures of her own, she read about them, transporting herself to such favorite venues as ancient Egypt, World War II submarine patrols, the Old South and, of course, Regency England. Soon she was keeping notebooks for jotting down story ideas. 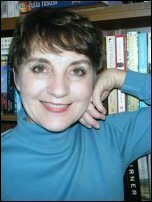 From plotting adventures for her first favorite heroine Nancy Drew she went on to write poetry in high school and college, then worked as a business journalist doing speeches, sales promotion material and newsletter articles. After her marriage to a naval lieutenant took her overseas, she wrote the newsletter for the American Embassy in Tunis, Tunisia and traveled extensively throughout Europe. Before leaving Tunis, she fulfilled her first goal: completing a Regency novel. Children intervened, and not until her husband left the Navy to return to his Texas homeland did she sit down to pen a second novel. The reply to her fan mail letter to a Regency author led her to Romance Writers of America. From the very first meeting, she knew she'd found a home among fellow writers--doubtless the largest group of people outside a mental institution who talk back to the voices in their heads. Her second goal was achieved the day before her birthday in May, 1998 when Margaret Marbury of Harlequin Historicals offered to buy that second book, the Golden-Heart-Award winning novel that became THE WEDDING GAMBLE. Since then, she has gone on to write fourteen novels, three novellas and an on-line serial, along the way winning or finalling for historical awards from The Golden Quill, the National Reader’s Choice, Romantic Times, and All About Romance’s Favorite Book of the Year. Julia now inhabits an English Georgian-style house she and her husband built in the East Texas countryside where, if she closes her eyes and ignores the summer thermometer, she can almost imagine she inhabits the landscape of "Pride and Prejudice." In between travelling to visit her three children (a naval officer son stationed in Washington, DC, a textiles and design major daughter who cheers for University of Texas at Austin, and a mechanical engineering major son also at UT Austin) keeping up with her science teacher husband and juggling a part-time day job as a high school French teacher, she pursues her first and dearest love--crafting stories. To relax, she enjoys watching movies, reading (historical fiction, mystery, suspense) and puttering about in the garden trying to kill off more weeds than flowers.